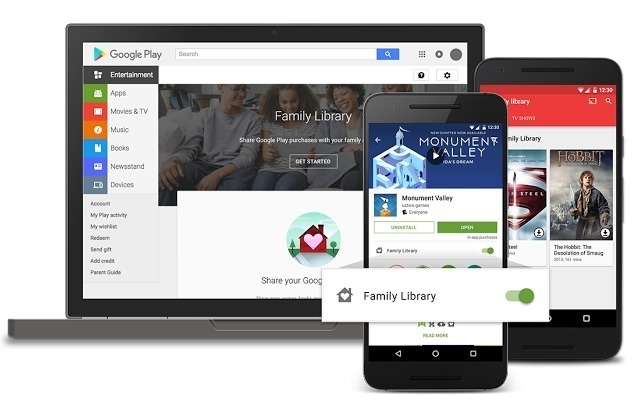 Now, Google Allows You to Share Paid Apps With Upto 6 People Through Family Library! Apple iOS users will be familiar with Family Sharing feature that came out in iOS 8. It allows iOS users to share iTunes purchases with six members of one’s family. So once the devices are connected, one of the family members can keep a check on the apps purchased on the other device. Bringing the same feature to Android, Google announced the Family Library at Google I/O 2016 and was expected to be launched on 2nd July, but the release date got extended by about 4 weeks, and finally the software giant has launched the service for Android users. The service allows you to share your Google Play Store purchases with up to six family members, or whoever you assign as your family. When you buy an eligible app, game, movie, TV show, or book in the Play Store, you can share it with your family, across devices, with no additional sign-up fee. Family Library will be available to select countries for now – Australia, Brazil, Canada, France, Germany, Ireland, Italy, Japan, Mexico, New Zealand, the United Kingdom and the United States. Other countries will soon get support for this service, but will have to wait for a little longer. The best feature of this service is that your family does not have to purchase it separately from the Play Store now. Also, now a purchased book or a movie can be viewed separately on the shared devices, which we think is a great functionality. How does it benefit apart from monetary advantages? Family Library allows you to choose what apps you want to share and what you want to keep to yourself. For example, specific games you might like to keep private but books and movies you would like to share with others in the family. For now, only apps, games, movies, TV shows, and books can be shared with family members. Some items can only be shared if they have been purchased with a specific payment method. Elders can also keep a tab on the purchases made by the younger ones by approving or declining their purchase requests. This has been made possible by adding a family credit card. When you add family members to the group, you have to select a credit card as the payment option, although family members can purchase from Play Store with their own credit cards and gift cards as well. Google Play Music also has its own family plan that allows users to stream more than 35 Million songs at $14.99 a month. Of course, individual users can stream the same purchased song at the same time. This also gives users access to YouTube Red in the United States. There is one restriction with the Family Library service, that any app or song or book that can be shared, purchased before 2nd July will not necessarily allowed for sharing. Also, the Play Music subscription comes separately, so non-subscribers cannot share music with the others at the moment. The good thing is that anything purchased after 2nd July will automatically be eligible for sharing through this service. However, we wished Google gave it a little more thought and opened the sharing horizon to forever. Again, with restrictions on music sharing are bound to cause dismay to Android lovers, who have been using this ecosystem for long. Nevertheless it is a step in the right direction and I’m pretty sure Google will be getting rid of these hurdles soon. India will have to wait a little to use this service, but you can always sign up on Google Play Store’s page here. "Now, Google Allows You to Share Paid Apps With Upto 6 People Through Family Library! ", 5 out of 5 based on 1 ratings. [Updated] Road Ministry Clarifies – No Proposal For Uber/Ola Cabs to Use Taxi Meters! Google Extends Play Store Carrier Billing to Airtel & Vodafone Users in India! Google To Train 2 Million Mobile Developers in India!